Intel has added two more server makers to the roster of those who want to build Itanium-based systems: Huawei Technologies and Inspur. That's a 50 per cent growth rate in the Itanium OEM base. At the Intel Developer Forum in Beijing this week, Kirk Skaugen, general manager of the chip maker's Data Center Group, said in his keynote address on Wednesday from the event that Huawei, a huge maker of telecom and networking equipment that has decided to make its own servers rather than buy them and tweak them for its telco and service provider customers, has become an OEM partner for Intel's Itanium processors. Huawei already sells a line of rack and blade servers called Tecal. The Tecal E6000 blade chassis supports up to ten full-height blade servers, sporting two Xeon 5500 or 5600 processors, in its 7U chassis; it is what we would call an enterprise blade server in that it does not support the AdvancedTCA or PICMG blade server standards created by the telecommunications industry, which by the way allow for the mixing and matching of blades from multiple vendors in a chassis, unlike enterprise blade servers. The Tecal T8000 series of blades are PICMG3.1 compliant and put a dozen DC or AC blades into a 14U chassis. There are also two different Tecal R Series rack-mounted pizza box servers that Huawei makes and sells to its telco and service provider customers. Skaugen was not specific, but said that Huawei was going to be building its own Itanium-based servers for high-end telco systems, which would complement other Xeon designs it is working on. While we don't know what Huawei is up to with Itanium processors, we do know that it recently tried to buy 3Leaf Systems and failed because of opposition from the US government. 3Leaf had created a chipset called "Aqua" that allowed up to 16 Opteron-based servers to be lashed together into a single shared memory system; the company was expected to have a similar technology this year for Intel's "Sandy Bridge" Xeons, possibly based on the Xeon E5 processors due in the third quarter, or possibly on another Sandy Bridge part. Clearly, the company needs some big iron for something. At IDF Beijing, Skaugen showed off an Itanium box from Inspur, which he called the largest server maker based in China. 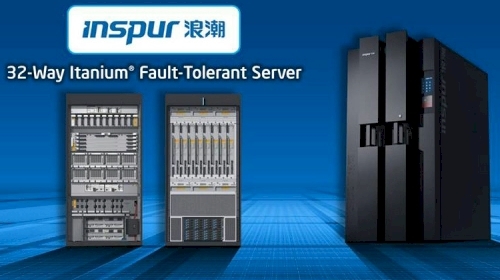 Last year, Inspur launched the Tiansuo TS series of "high-performance servers," which it said were part of the "national plan of 863" and fulfilled its commitment of "Serving China with Internationally Required Quality" for Xeon and Itanium machines. The 863 program, which is funding development of processors, supercomputers, and other high-tech products, seeks to wean China off foreign technologies; it was started in March 1986. The Loongson MIPS-derived processor has its roots in the same program. What Inspur launched last year were clusters of Xeons or Itanium nodes linked by InfiniBand networks, called the Tiansuo TS10000. Skaugen said that Intel was working with Inspur and the Ministry of Science and Technology to create a 32-way, fault tolerant Itanium-based server, and said further than the China Construction Bank, one of the big four banks in the country, was also working on the Itanium server as an early customer. HP sells fault tolerant, Itanium-based servers with the Integrity NonStop brand, but it seems unlikely that Inspur is just slapping its labels on these boxes. It doesn't look like a Superdome 2 or NonStop blade setup from HP. HP is still making Itanium servers, and Super Micro has a four-socket, dense-pack Itanium 9300 box, which it announced last year. Bull has upgraded its NovaScale mainframes to the most current Itanium 9300 processors. NEC has also said that it is planning to deliver a future Itanium machine to run its mainframe environment, but both Bull and NEC have abandoned their general purpose Itanium servers for running Windows or Linux.